PEDESTRIANS in Oxford have drawn up a top 10 list of trouble spots in the city. Oxford Pedestrians’ Association put forward the list of where people face danger from passing traffic as part of public consultation for the Local Transport Plan, covering the period 2011 to 2016. Pedestrians’ Association chairman Paul Cullen said there was no reason why the county council couldn’t start working on improvements before 2011. He said: “The council has expressed a desire to improve conditions for pedestrians with its Transform Oxford scheme.We believe the council’s proposals do not go far enough and ignore high traffic volumes in locations like Hythe Bridge Street and Worcester Street. Oxford is the right size to be turned into the most walkable city in the UK but a lot of work needs to be done before it could win that title. “I have written to the Department for Transport to suggest that cities should compete to become Britain’s first walkable city. That would certainly help to spur on the county council when it comes to addressing where the trouble spots are for pedestrians in Oxford". “The Conservative-led administration on the county council has promised to do more for pedestrians in Oxford as part of their Transform Oxford proposals and we would like to see them start working on them as soon as possible. Oxford is a city where you can walk home on foot after the last bus has gone, but there are some serious traffic issues for pedestrians which still need to be resolved". Association secretary Corinne Grimley Evans said Hythe Bridge Street was one of the worst pedestrian routes in the city centre. In 2008, the county council announced its Transform Oxford proposals to pedestrianise parts of the city centre, including Queen Street, Magdalen Street and part of George Street by 2011, with the number of buses in the city centre reduced. Work started last year to resurface George Street and reduce the number of buses using the route. 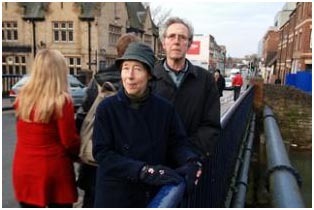 County council spokesman Owen Morton said: “In November and December last year we asked stakeholders, including Oxford Pedestrians’ Association, to give us their suggestions for possible schemes for us to include in the programme for our next Local Transport Plan, which will run from April 2011. Hythe Bridge Street. Solution: change traffic patterns in Hythe Bridge Street and Park End Street. Frideswide Square. Solution: redesign to improve pedestrian routes. Cornmarket Street - Carfax end. Solution: create a single surface so pedestrians can cross the St Aldate's/High Street junction more easily. Cornmarket Street - George Street end. Solution: create a single surface and remove the traffic lights. Turl Street. Solution: create a single surface to replace narrow footways. Worcester Street. Solution: enlarge signalling area at Beaumont Street junction to help pedestrians avoid narrow pavement. Longwall Street. Solution: widen narrow footways and reduce traffic volume. Walton Street. Solution: widen narrow footways north of junction with Beaumont Street as far as Phoenix cinema. The Plain. Solution: bring pedestrian crossings closer to the junction.